The Shadow Lands is a novel that you won’t easily forget. The reader follows Alexandra Boyd and her Bulgarian cabbie friend as they drive around Bulgaria, trying to find the people who belonged to the urn that Alexandra accidentally took. 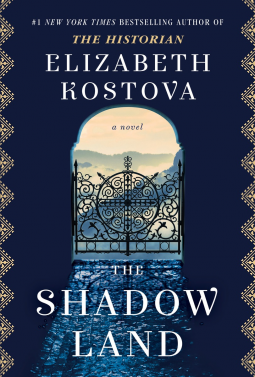 As they search for Stoyan Lazarov’s family, she learns about his tragic background and discovers that some secrets are very dangerous and people will do anything to keep them from being discovered. I couldn’t get enough of this book. The way it was written, the cover, where the book was set, the storylines, the perfect blending of past and present and the right amount of mystery was what kept me reading until late in the night. I couldn’t put it down, it was that good!! Alexandra was such a tragic figure at the beginning of the book. The loss of her brother was huge and the toll it took on her and her family was very tragic. But I also thought she was a little too trusting. I mean, after meeting the Lazarov family and accidentally taking the urn, she starts to galavant around the country with Bobby. All I could think about was that she was going to become another statistic at some point in the book. So glad that didn’t happen. I actually really liked Bobby even though he did come across as a very secretive man. He was the first friend that Alexandra had and he was good to her. He was a bit condescending about American’s though (but I think most of the world is….lol). What I really liked was when the book flashed back to Stoyan Lazarov and told his story. It was fascinating to look at how the communists dealt with perceived criminals (real and those in the wrong place at the wrong time like Stoyan). I had chills reading about that because of the similarities to Hitler’s concentrations camps in World War 2. Stalin was just as bad as Hitler. Just as bad :(. To my recollection, I haven’t read a book that is set entirely in Bulgaria. I was fascinated by the customs, by its history (both good and bad) and just the atmosphere the book had while I was reading it. Again, something I couldn’t get enough of and I think, once my kids are grown, that I might have to take a trip there. The end of the book was pretty good. The storylines were married beautifully together and the book ended with a what I thought was a HEA. Why: A great, immersive book that took me from present-day Bulgaria to the past and back effortlessly. I couldn’t read enough of this book. I do wish that a small glossary was included with the meanings of the Bulgarian words. My Kindle’s dictionary did not recognize the words (and didn’t have an option for Bulgarian)….lol. Also, I was left wondering about Alexandra’s scar. It was mentioned quite often and I don’t remember seeing an explanation about how and why she got it.